This is led many to conclude that they don’t need to be concerned about electrolytes during extended fasting. This is further exacerbated by Dr Fung being a clinician, IE, Dr Fung runs a weight loss clinic. He has thousands of patients and if he says that electrolytes are not needed then they are not needed… Or so the logic goes. However, there are many others in the keto community who will tell you that they got into serious trouble by ignoring electrolytes. In particular, they had to end fasts due to electrolyte levels being way too low and some have ended up in the ER getting electrolytes via IV bags. Fung’s book has different messages on electrolytes depending upon the fasting length. p.48-49 During short-term fasts, salt depletion is not a concern. p. 49 During prolonged fasting (more than a week) the kidneys are able to reabsorb and retain most of the salt needed by the body. However, some salt supplementation may be required. People seem to miss the second part (on Extended Fasting). If you experience dizziness during your fast, most likely, you’re becoming dehydrated. Preventing this requires both salt [ed: Sodium and Chloride are two electrolytes] and water. The same advice is given for headaches on the same page. Low magnesium, which is particularly common in diabetics, can cause muscle cramps. You may take over-the-counter magnesium supplement. 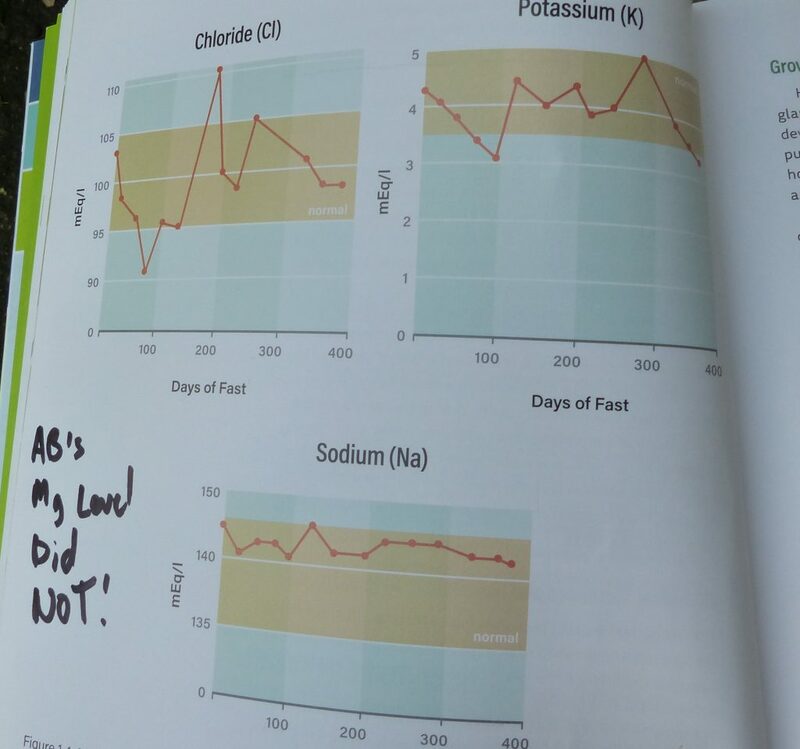 The book shows charts for Chloride, Potassium and Sodium. But what is missing from these charts? What is in the charts themselves? And, who is the subject of the charts? The charts are from the Guiness Book record holder for longest extended fast, Angus Barbieri. I have written about Angus’ fast. His fast was medically covered in this study (Stewart, Features of a successful therapeutic fast of 382 days’ duration). There are some significant things of note. Angus was 456 lbs at the start of his fast. To use his extreme situation as evidence that electrolyte supplements are not needed during an extended fast is sketchy at best since he had so much available substrate to draw from during his fast. Further, Dr Fung omits in his book Angus’ Magnesium (Mg) levels which were published in the study and did show him with low Mg levels for much of the fast. The Normal range is clearly marked and the points are below that line. This is the figure from the study itself. As you can see Angus’ Magnesium levels did drop during his fast very quickly and were on the low range of normal for almost the entire fast. While monitoring the world-record-breaking 382 day fast, researchers measured the magnesium content within the cells, which remained firmly in the normal range. Nevertheless, we often supplement patients with magnesium to be on the safe side. During the 382 days of his fast, vitamin supplements were given daily as ‘Multivite’ (BDH), vitamin C and yeast for the first 10 months and as ‘Paladac’ (Parke Davis), for the last 3 months. As you can see, Angus was actually given Magnesium, Potassium, Calcium and Phosphorus during his fast in the form of a supplement. Not in high dosage but not ZERO either. Did Angus Receive Other Electrolytes? The most serious issue with respect to Dr Fung’s claims about Angus’ fast however, is the study indicates that Angus actually did receive additional electrolytes during the fast. From Day 93 to Day 162 only, he [sic: Angus] was given potassium supplements (two effervescent potassium tablets BPC supplying 13 mEq daily) and from Day 345 to Day 355 only he was given sodium supplements (2.5 g sodium chloride daily). 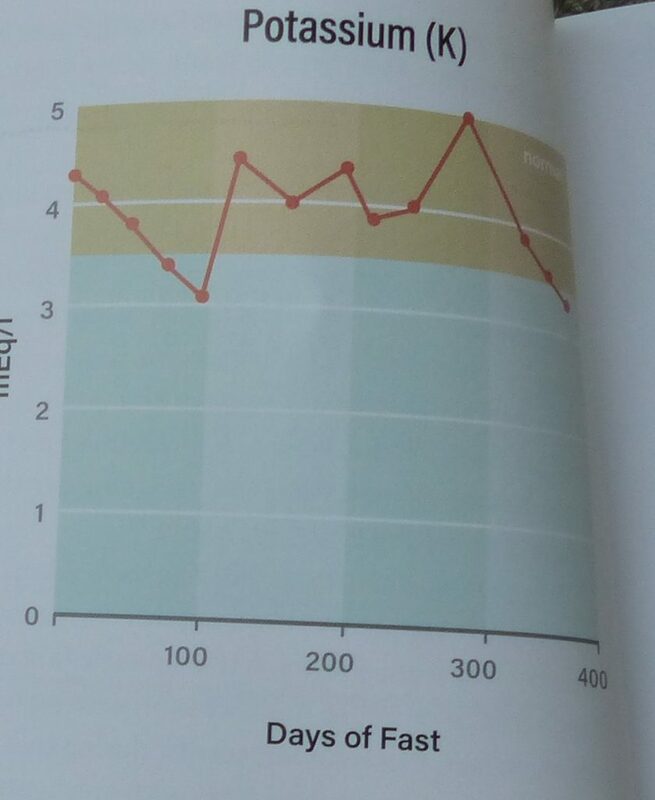 Here’s the chart from Dr Fung’s book which clearly shows Angus’ Potassium levels dropping below normal to the point where he was given potassium supplements (day 93 in the study). They went up to normal after Angus was given the Mg supplements and even after he discontinued the supplements. Angus Barbieri is an example where electrolyte supplementation was required which is the exact opposite of what Dr Fung says in his book. Angus Barbieri was not only given Potassium when his levels fell, he was also given Sodium Chloride for another portion of his fast. He also had a daily vitamin which contained these elements. Angus Barbieri was medically monitored and tested during his extended fasts. The doctors could tell when to supplement and when it was unnecessary. It is a serious mistake to use Angus Barbieri as evidence that electrolyte supplementation doesn’t need to be done in Extended Fasting. Fung’s book on this subject is sloppy and ignores the evidence in the study. It sends a mixed message in the practical advice section later in the book from what it sent in the earlier part of the book. I respect Dr. Jason Fung very much, but you right in this point. 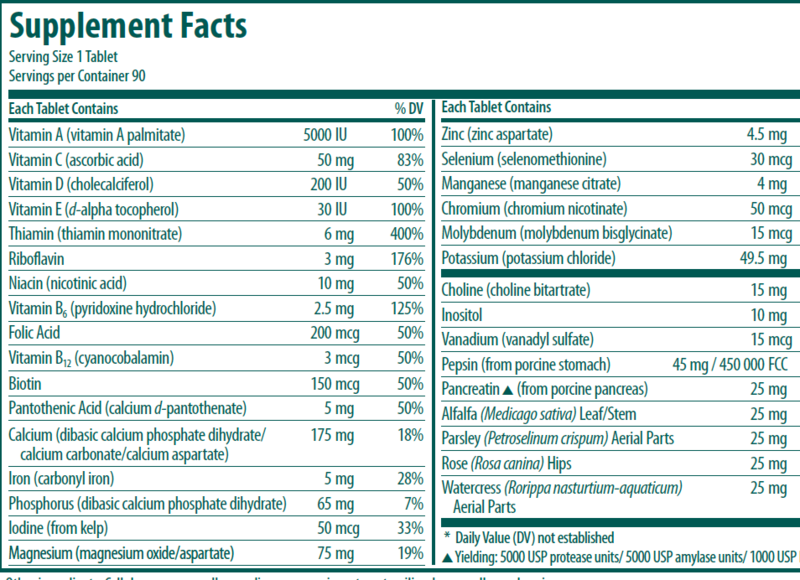 I have one question, where did you get the Supplement Facts from Mutlivite BDH? The company BDH in UK was bought by Merck and I couldn’t get my hands on a sample. I don’t even know, where to by this product. Or does BDH from India produces a Multivite to catch clients because of the name similarity? I have a lot of respect for Dr. Jason Fung and I love his work. But you are right about your point here. I have just one question, where did you get the formula for Multivite? The company BDH (form UK) does not exsist for many years. I think they got bought by merck. There is a smilar named company (BDH) in India nd they are producing supplements too. 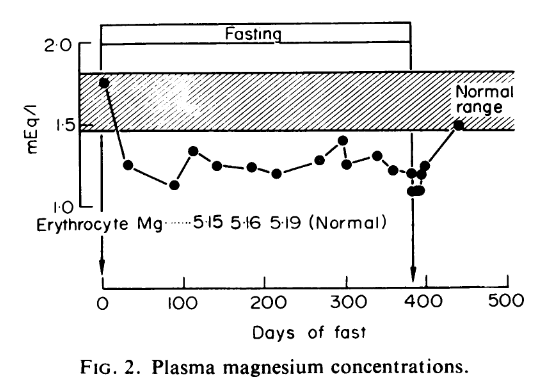 So, please ignore the line on the graph (which represents serum magnesium). Instead, please look at the “Erythrocyte Mg” numbers (which may indicate intracellular magnesium) instead. Next Next post: Yang – Part 1 – What is Lost During a Diet or Fast?